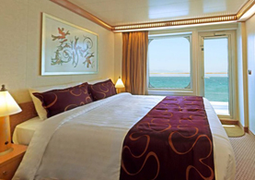 Enjoy an action-packed Mediterranean cruise vacation with the Costa Fascinosa! Launched in 2012, the Costa Fascinosa is a colorful, action-packed cruise ship great for families and fun-loving passengers of all ages. With a design themed around "things that fascinate," the décor is a tribute to celebrities, exotic places, and pop culture. The ship undertakes exciting voyages along major ports in the Mediterranean, drawing sun seekers and party goers alike with its wide range of onboard activities. Snooze the day away laying by the pool, then tear it up on the dance floor of one of the ship's many bars and clubs all night. Wake up in time for a light Mediterranean breakfast at the restaurant or buffet, then recuperate from your late night with a nourishing treatment at the spa. 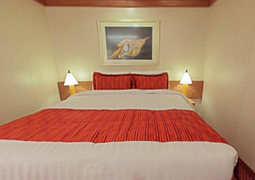 There's so much to see and do, you won't ever want to leave the ship. 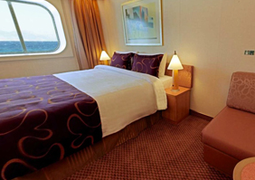 Staterooms start at a compact 185 square feet, and nearly 40% of staterooms have a private balcony. For an exceptional experience, book a Samsara Spa stateroom, where you'll be privileged to exclusive complimentary access to the spa facilities. The dining on the Costa Fascinosa will give you a true taste of the Mediterranean lifestyle. Wake up in the morning with an Italian espresso at breakfast, enjoy fine pasta at lunch, experience an authentic Italian pizzeria at night, and of course, don't forget the gelato! 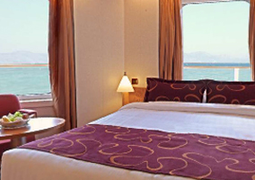 For those watching their weight, spa-themed Ristorante Samsara serves healthy and low-calorie food for a modest fee (free for Samsara Spa stateroom guests). And those longing for a taste of home will not be disappointed by Club Fascinosca, a specialty steakhouse and wine bar. There's no shortage of entertainment on the Costa Fascinosa. From original, multilingual musical productions, to onboard acrobats and dance troupes, to Grand Prix racing simulators. Kids' clubs for all ages are available for no cost, though children are also welcome to roam the ship and play by the pool. The Samsara Spa and thermal suite provides rejuvenating treatments and quiet retreats, while gambling fans can get their adrenaline pumping at the Millionaire Casino. Be sure to reserve one evening for bar hopping – with six different clubs and lounges to choose from, you won't want to miss out on a single one. The dress code on Costa cruises is casual throughout the day and night. Although passengers are encouraged to dress smart casual for dinner in the sit-down restaurants and wear tuxedos and dresses on Formal Nights, these recommendations are not strictly enforced, meaning you'll still see a mixture of casual and semiformal clothing at night.